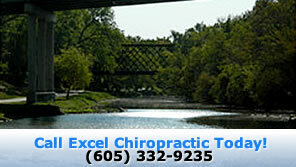 Excellent Chiropractic care for Sioux Falls residents. Dr. Perry Langston and Dr. Corey Touney have joined forces to bring the very best in chiropractic care to Sioux Falls. At Excel Chiropractic the focus is to improve the overall health in 4 areas: Spirit, Body, Mind, and Will. We not only want to relieve your pain, but help you in your wellness goals. Please take time to explore our site and learn more about what chiropractic is and what chiropractic isn’t. We look forward to sharing our knowledge with you. Our major practice philosophy is “Are we the right place for you?” Not everyone wants to participate in his/her own health care. They expect someone else to take responsibility for their health. Because chiropractic is based on your nerve system and your body’s ability to heal itself (not to mention that you are out of our office more than you will ever be in it), your care here is a partnership. We inform you of your needs, we suggest options, and then give you the best chiropractic care possible. It’s really pretty simple and stress-free. I want my practice to grow by the referrals of the excited, loyal, happy, and healthy people that have chosen us for their chiropractic care. Call our Sioux Falls office to arrange a consultation so you can discover how chiropractors produce results the natural way without drugs or surgery.